A light of total knowledge. Remote, isolated, independent stance. Mind, thought... celestial expanse. Alpha, being, omega, containing. No dimension, all dimensions nothing remaining. Individuality, infinitesimality, fill the vacuum. Totality, universality, embrace the continuum. Awareness, because, like the 1s, this is a card for those who think and use their mind. 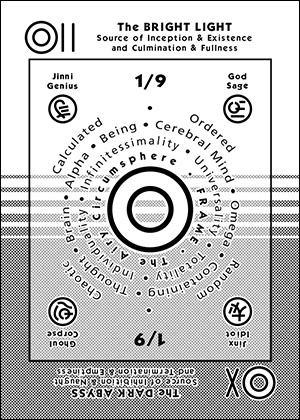 Sanity, because, like the 9s, this is a card for established order in the universe - utopia.